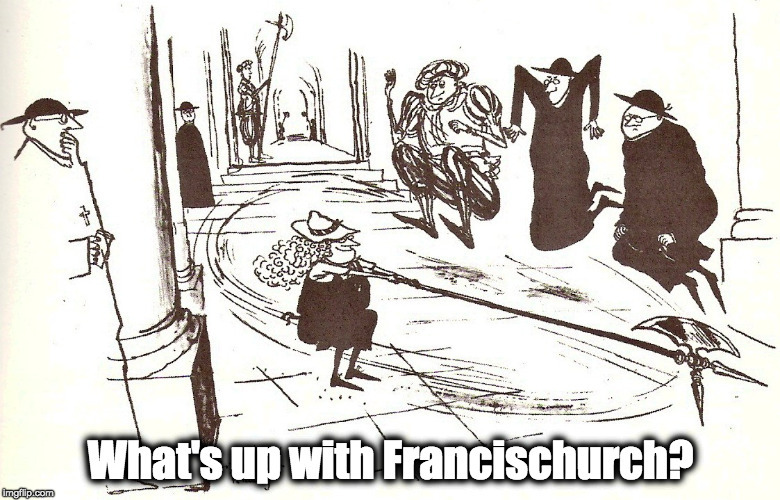 The smiling executioner: when death becomes an obligation – What's Up With Francis-Church? I know everyone is watching in fixed and horrified fascination as a hospital in the UK fights not to save but to end the life of a small boy. It’s most of the reason I haven’t posted anything in the last few days. Alfie Evans is only the latest case of this kind in a Britain that long ago embraced a standard of ethics in medical care that includes euthanasia as a form of “care”. I’ve seen many comments on Twitter to the effect of, “But WHY is this hospital so determined to end Alfie’s life? It wouldn’t cost them anything to just let his parents take him to Italy. Why are they effectively holding this child prisoner, against his parent’s wishes, simply in order to ensure that he dies?” People are baffled, and outraged. They don’t understand this determination to ensure the child dies. I promised myself up and down that I wouldn’t get involved in this. It was exactly this kind of issue that I started with in the pro-life thing way back when. In fact, it was specifically this kind of issue – the radical departure of our society from a Judeo-Greco-Christian worldview in ethics – that got me involved. In 1999/98 I spent a year doing little other than reading modern philosophy. This was when I discovered something had been going on for a long time that was moving our entire civilisation away from what we could call “classical ethics” – that in medicine we call Hippocratic ethics and into a totally new paradigm, something alien and ultimately – if taken to its own internal, logical conclusion – obscenely evil. 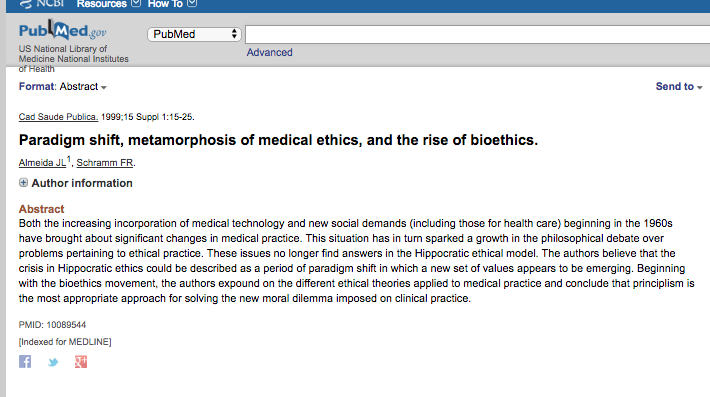 Hippocratic ethics are the kind we all assume without thinking is at work in the medical world. It is the background assumption that most people accept without realising, based on multi-millennia, “perennial” philosophy, articulated by the Jewish Mosaic law, later blended with Greek thought, codified in Roman jurisprudence and finally developed in the Middle Ages by the Scholastics. It is the philosophical background that we all assume is running our world. This is where the confusion is coming from. Among the “elites” – including hospital and government medical ethics boards, the “experts” so many people are citing in the Alfie Evans case – there is an entirely “New Paradigm” at work, one that is actively opposed and hostile to that ancient, perennial “Classical” model. This shift took a long time, and was mostly accomplished at “higher” societal levels than ordinary people function in. This is where the bafflement comes from. Nearly all people in our post-Christian societies remain philosophically Christian, even if they don’t realise it or profess Christianity themselves. We assume that it’s just a rule that doctors, nurses – and judges – don’t kill innocent children. The reason I say that I wanted to stay out of the Alfie Evans furore was that my own discovery of this paradigm shift was a major point of crisis in my own life. I remember really well the day I understood it completely. I had been reading for a while and was starting to get it. Then one day I suddenly understood that everyone was OK with it, mainly because they hadn’t really thought about it. Because their Christianity was nothing more now than a kind of cultural background noise – and because they had mostly been so mis-educated that they no longer had the capacity to recognise the inherent irrationality of a logical contradiction – it was easy for these “elites” to just change the tune with no one noticing. It suddenly occurred to me that most people passively supported the idea that it could be “compassionate and caring” to murder helpless, sick and old people. It came to me in one of those horrible flashes of insight, while I was sitting on a bus. I looked around and realised that in all likelihood every single person on the bus probably thought it was a good thing to kill people or to kill yourself, if your life had become “burdensome” or painful. That death was better than life had become the background assumption of our society. I realised that the old legal definition of insanity (also changed in the New Paradigm) described as a a person being unable to tell the difference between right and wrong, applied to nearly everyone around me. I started having a panic attack – my very first one ever – and jumped up from my seat and asked the bus driver to let me off because I was going to be sick. He opened the door, and I got off the bus, and the subzero temps calmed me down a bit (February in Halifax, Nova Scotia doesn’t care how upset you are). I walked home, unplugged my phone and didn’t come out of my house for a week. A few months later I started understanding more and more what was happening. And even worse, how much my own mind and conscience had been malformed over the years by this evil ideology. I started going to talk to a priest about it all (poor guy) and we determined that it was time to do something about it. I started doing work for Campaign Life Coalition, thinking I could fix the problem. And that sense of horror never really went away. In fact, the more I learned about what had happened – and as a consequence of that, what was going on right now in hospitals and biotechnology research labs – the more my sense of horror grew. It became a kind of obsession to learn more and I never lost the awareness that nearly everyone else, almost everyone I would talk to, assumed it was fine to kill people, as long as the “experts” said it was OK. After a while I felt as though I was living in enemy territory, a spy behind enemy lines. Some time after that it began to feel as though I lived in a parallel universe where I could see and hear everything but was completely unable to communicate with anyone, like being forced to watch atrocities but being totally unable to act against them. And here we are, 20 years later, and a court has ruled that although his parents have permission to take Alfie Evans home, he is still being effectively held prisoner, refused medical care for his still-undiagnosed condition, specifically in order to assure that he doesn’t live. The British medical system and courts have determined that Alfie has to die because of the working assumption that death is preferable to life for disabled people. When my friends email me to tell me how they feel about it and say things like, “I can’t fathom this,” all I can think or say is, “I can.” For those who are horrified and perplexed and baffled by what is happening to Alfie Evans (and to Charlie Gard before him) I can certainly empathise. But I can say that I’m not perplexed or baffled. This is the only possible destination of the path we’ve been on for a long time. This is where we had to go. And no, I’m not making it up. It should hardly be surprising that after two years of full time work as the “research director” for a national pro-life lobby, after trying desperately to tell legislators and bishops what was going on, and having them react with complete, blank, bovine incomprehension, I had a species of breakdown. That was the day I was supposed to be writing a speech that someone else was going to give to a group of Toronto priests. A sense of total futility descended on me like a poisonous cloud. I felt paralysed, and burst into tears. I couldn’t stop crying. Eventually the office manager came in and said I should go home. I took a week off and at the end of it resigned. I guess it’s true there is only so much a person can take. This is the reason I was a bit reluctant to talk about Alfie Evans. 20 years ago, I saw this locomotive coming straight at us, and I knew that children, sick people and old people were going to be ground under its wheels. I spent many years trying with increasing desperation and hopelessness to warn everyone I could and got nowhere. I expected it to be worse now, and it clearly, CLEArly is. Years ago I started writing about the concept of “nice evil,” evil that kills but does it for “kindness” and “compassion.” This is the “banal” evil that Hannah Arendt wrote about after Nuremberg. But now it has evolved. It has moved from being an indifferent and bureaucratic evil, to being a kindly and merciful evil. We are now required to smile gratefully at our executioners. Reading so many comments under the hashtag posts from ordinary people calling for Alfie Evans’ death – in his “best interests,” and because the “experts” have said it has to be – I can see we have advanced considerably along this path from where we were 20 years ago. What is Utilitarianism, and why is it in our hospitals? One of the best and most succinct explanations of Utilitarianism I’ve ever heard of came from a Chinese Catholic philosopher speaking at a conference on ethics at Rimini in 2013. Tianyue Wu explained that Utilitarianism is, essentially, what you get when you have exhausted all other – better – philosophical proposals for life’s meaning. Utilitarianism is the void, where only power can survive, and leads inevitably – and often very quickly – to Nihilism’s thuggery. The extreme secularism of 19th century Chinese nationalism and then Communism, Wu said, has taken everything from the people that had made their lives meaningful, one by one: the nation’s historic philosophical foundations of Taoism and Confucianism – that maintained her social identity and cohesion for millennia – Buddhism and Christianity. In today’s China even socialism has been exhausted and no one is moved by anything but raw consumerism, the pursuit of immediate, material pleasure, the ownership of more things. Utilitarianism is what’s left when all faith dies. Utilitarianism was first proposed as a system of ethics – that is, applied philosophy – by English post-Christian philosophers in the 18th century. It states that the best action is one that maximises “utility” or usefulness, not only for the actor, but for the whole community. It was proposed by its founder, Jeremy Bentham, as a kind of mathematical formula in which, from the sum of all pleasure that could result from an action is subtracted the possible suffering. If the pleasure outweighs the suffering, the action is judged to be good. It is usually more concisely described as the “pursuit of the greatest good for the greatest number” in a given society. 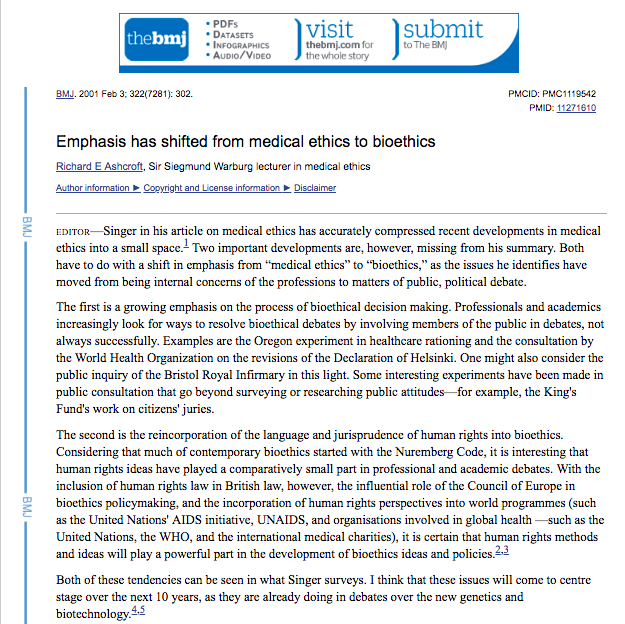 As it is practiced today in the medical world it is manifested as secular Bioethics, a system of ethics that was developed in the United States in the 1970s. Utilitarianism proposes that because there is no God, and we live in a materialistic universe devoid of objective meaning, human life is no more significant than any other animals; the “greatest good” is pleasure and therefore the rule of medical practice is to avoid human suffering at all cost. There is no such thing as inherent “personhood” in Utilitarianism. Personhood in this ideology is a legal fiction conferred by the State according to various arbitrarily determined standards. One of the things “Bioethicists” do in universities is come up with lists of criteria and methodologies for deciding when a patient’s personhood has ceased to be a significant factor in determining his fate. In Bioethics it is usually considered that “autonomy” is the determining factor, and a patient who is deemed to possess a reduced autonomy is also judged to have a reduced personhood. The more helpless, the less likely he is to recover…Well… The math here is clear. From all this, it becomes immediately clear why Utilitarian Bioethics is so keen on euthanasia. Killing patients for their own good is built right in. The other two watchwords of Bioethics are “beneficence” and “justice,” but these are not applied to the patient; it is justice for the community that is beneficently sought by obtaining the death of a patient whose personhood has been drained away by his illness. These, of course, include those judged to be in a “vegetative state,” or who are said to be “brain dead,” or whose condition of dementia is so severe that treatment, including things like antibiotics in cases of pneumonia, is judged to be “futile”. Such patients Bioethics regards as “bed blockers.” Simply put, they are taking up room and resources that could be more profitably spent on more hopeful cases. Disillusioned Chinese suffering from empty materialism: Chinese philosopher. Also called Principlism, Bioethics was created by congressional order in 1978 as a “normative” system of ethics to help legislators create laws in emerging areas of biomedical research, including genetic and cloning research and organ transplantation. It was also applied to the emergence of cases in which patients were being kept alive on respirators. The concept of the person as a legally protected entity appeared in Roman jurisprudence, but as we understand it now was mainly a product of medieval Christian philosophy and is based on the concept of the human being created in the image and likeness of God. If you want to learn what I learned, this is the person to look up. This is Dianne Irving, who holds multiple PhDs, one of which is in Bioethics. A former bench research biochemist/biologist (NIH, NCI, Bethesda, MD), an M.A. and Ph.D. philosopher (Georgetown University, Washington, D.C.), and Professor of the History of Philosophy, and of Medical Ethics. She was among the first class of postgraduates of the Kennedy Institute of Bioethics at Georgetown university, and she was and remains among the very, very few academic voices willing to speak out against the New Paradigm (and she has suffered accordingly). She’s something of a controversial figure, as one would expect, and she was my mentor through that whole period in the early 00s when I was learning this. I started reading general modern philosophy, and started seeing something wrong, something awful was happening. When I came across her work – and I read every one of her articles I could find – I understood what that wrong thing was. I was hugely honoured when she started corresponding with me by email, and when we finally became friends through many, many long, difficult and complicated phone calls. She walked me through two years of hellishly emotionally difficult work on Canada’s biotechnologies bill. I owe her a great debt. Part of my payment for that debt is to pass on what she taught me. There is indeed a very clear – horrifyingly clear – explanation for what is happening to Alfie Evans today. But be careful. This isn’t a nice thing to look up.